Great for a weeknight meal. Prep and cook time took less than an hour in total with mostly pantry ingredients. The bacon and onion provide a lot of flavor. I used shrimp broth instead of clam juice. To serve two, I halved the amount of fish but kept everything else the same. Increase the amount of sausage. Worcestershire sauce is the unusual ingredient in the marinade/dressing for the chicken, but it melds well with everything else. I had to add quite a bit more liquid to the rice to get it cook thru. Also, a tad too sweet for my taste, next time I'll cut down on the amount of carrots and use regular onion instead of sweet onion. Be sure to allow enough time for this seemingly simple dish. You need to carmalize the onions on the stove top first which took close to half an hour and then the assembled dish need to be baked for another hour. I did not have any Gruyère, in the house, so just sprinkled Parmasan on top. Great dish for the garden fresh zucchini and tomatoes. This recipe is not in my magazine copy. Pretty good bread, not too sweet. Have to let the shredded zucchini stand for 30 minutes to give up their liquid and uses a stand mixer to cream the butter and sugar. With this new annual series, America's Test Kitchen has taken on the challenge of lightening up some of our favorite recipes from the previous year. 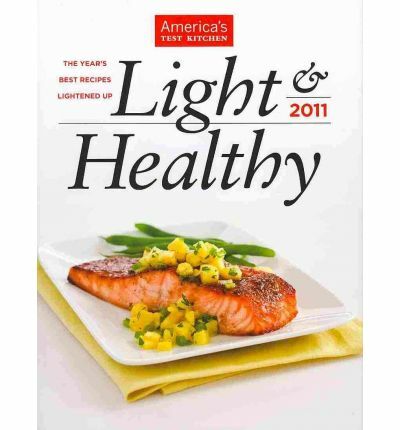 Light & Healthy 2011 features a variety of recipes, from soups, salads and entrees to side dishes, baked goods and desserts, all of which maximize flavor to give you healthy recipes you’ll actually want to eat — from Chicken Cordon Bleu to Cherry Almond Coffee Cake. You won’t find any “lite” cooking gimmicks here such as tiny portions, fussy tricks, or sub-par nonfat ingredients. What you will find is what everyone expects from America's Test Kitchen: solid (and often innovative) cooking techniques, a mastery of kitchen science that allows us to find ways to cut fat but not flavor, and repeated recipe testing to ensure that your dishes will taste as good as their full-fat counterparts.